CM Magazine: Joking Around with Chirp. 96 pp., pbk. & hc., $8.95 (pbk. ), $16.95 (hc.). ISBN 978-1-926973-65-4 (pbk. ), ISBN 978-1-926973-64-7 (hc.). Finally, mixed among the riddles and knock-knocks, there are some tongue twisters: "Say this 5 times fast: Four flying feathered friends". 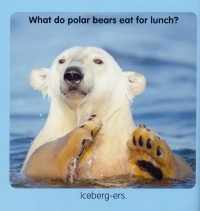 Most of the bits of humour appear one per page, but a number of times several bits of themed humour are presented on a single page or a double-page spread. For example, the hummingbird riddle in the excerpt is just one of four bird-focussed riddles that are being shared by two birds perched on a wire. Almost all of the humour is geared to the correct audience level, but there are occasional slips. For example, a non-spelling preschooler might not get the homophonic response to: What did the lighthouse say to the ocean? ("Sea you later."). And I think you have be of a certain age to get the "Let's twist again" answer to "What did one tornado say to the other?" The contents are most attractively designed with the jokes, riddles and tongue twisters appearing on pages that are either full-colour photos of wild and domestic critters or Bob Kain's artwork featuring the iconic Chirp. 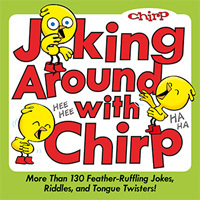 Joking Around with Chirp is an excellent home or library purchase for beginning readers as its contents demonstrate how much fun and pleasure can be derived from the printed page. Dave Jenkinson, CM's editor, lives and laughs in Winnipeg, MB.